Rancho Los Alamitos Historic Ranch and Gardens, Long Beach, Calif. 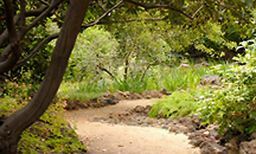 The remarkable historic landscape of Rancho Los Alamitos will unfold before your eyes as we tour its four acres of gardens, designed by some of the most significant landscape designers of the early-to-mid 20th Century, and its early 19th Century adobe ranch house and barns. Rancho Los Alamitos Director Pamela Seager will illuminate for us this property’s successful road to preservation.